Nos, José Luis Escobar Alas, por la gracia de Dios y benignidad de la Santa Sede, Arzobispo Metropolitano de la Arquidiócesis de San Salvador, El Salvador, en América Central. Que la Iglesia cumple la función de santificar de modo peculiar a través de la sagrada liturgia (cfr. c. 834 §1) y que, a tenor del Derecho Canónico, corresponde al Obispo Diocesano ejercer en primer lugar dicha función por cuanto posee la plenitud del sacerdocio y es el principal dispensador de los misterios de Dios (cfr. c. 835 §1) y, en la Iglesia a él confiada, dentro de los límites de su competencia dar normas obligatorias para todos sobre materia litúrgica (cfr. c. 838 §4). Dado en el Arzobispado de San Salvador, a los treinta del mes de julio del año dos mil quince. Girls throw flower petals in a procession of Blessed Oscar Romero’s relics in Zacatecoluca, El Salvador, on July 18, 2015. Following the beatification of Archbishop Oscar A. Romero in May, the Archdiocese of San Salvador promulgated guidelines regarding the miracle required for Blessed Romero to advance to sainthood—the final phase of the canonization process. 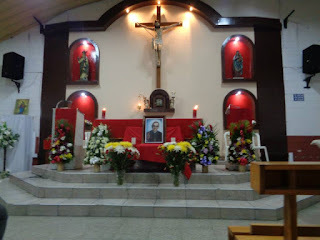 According to the Salvadoran Church document and a canonization expert consulted by «Super Martyrio,» for Blessed Romero to become “Saint Romero,” his supporters will need to demonstrate the occurrence of a miracle through his intercession—and to prove it though a rigorous medical confirmation process. «Super Martyrio» interviewed Fr. William H. Woestman, omi, J.C.D., a canon lawyer and author of a prominent tome about the canonization of saints to help us understand the miracle requirements. Fr. Woestman edited Canonization: Theology, History, Process, 2nd ed. (Ottawa, Faculty of Canon Law, Saint Paul University, 2014, 541 pgs.). He currently serves as Promoter of Justice for the Metropolitan Tribunal of the Archdiocese of Chicago, where a miracle by another high-profile sainthood candidate is under study. “We are in the process of investigating an alleged miracle through the intercession of Blessed John Henry Newman,” Fr. Woestman explains. Cardinal Newman was beatified by Pope Benedict in 2010 and, like Archbishop Romero, he is one miracle away from being declared a saint. We also spoke to David Mueller, of the Dorothy Day Canonization Support Network, about praying to support a saint’s cause. Reviewing the basics, the sainthood process consists of two tracks, each of which has two steps within its trajectory. First, a person is sainted either because: (A) they have led a holy life (the “way of confessors”—like Cardinal Newman) or (B) because they were killed for the faith (the “way of the martyrs”—like Archbishop Romero). Second—and regardless of which path is taken—the process consists of two stages: (1) beatification (which both Newman and Romero have reached) and (2) canonization (which neither has yet attained). Confessors need a miracle (and a declaration of “heroic virtue”) to be beatified and a second miracle to be canonized. For martyrs, martyrdom itself is the miracle that counts toward beatification, but a second miracle is required for canonization. Thus, Archbishop Romero, who has been beatified, is now in need of a miracle to be canonized. The types of miracles that the Church requires for canonization, according to the Salvadoran Church guidelines are “miraculous cures after the invocation of a Servant of God or a Blessed.” Accordingly, the requisite miracle requires a medical healing which cannot be explained by natural processes: such as “the instant healing from a serious illness, without having used any drugs or other cures; the disappearance of a severe atrophy; or that a wound should heal instantly.” (As the guidelines explain, “nature can correct the atrophy of a limb or heal a wound, but never does it instantly.”) To illustrate, the miracle that led to the canonization of St. John Paul II involved a woman who was cured of a brain aneurysm after doctors had told her that she only had a month left to live. Opus Dei founder St. Josemaría Escrivá was canonized following the cure of a cancerous chronic radiodermatitis sufferer of this terminal disease. St. Kateri Tekakwitha became the first Native American saint in 2012 after a young boy survived a severe flesh-eating bacterium which doctors had given up hope on, and declared that he would die. Fr. Woestman explains that the miracle need not occur within the province within which Romero is recognized as a “Blessed” (unlike canonization which pertains to the universal church, beatification is limited to a given geographical zone). Therefore, the person reporting a miracle need not be from El Salvador: “It can be from anyone, anywhere in the world.” In fact, the person claiming a miracle need not even be Catholic (therefore, the phrase in the introduction to the Salvadoran Church guideline that talks about “a miracle obtained by a faithful Christian through the intercession of Blessed Oscar Romero” should not be taken as a limitation). In the event that the miracle occurs in a diocese other than San Salvador, “the bishop of the diocese in which the cure took place is competent to conduct the investigation,” explains Fr. Woestman, pointing to the miracle in the Newman case mentioned above (Blessed Newman’s cause is promoted by the Birmingham Oratory in England, but the miracle is being investigated in the U.S.). Although there is no geographical limitation on where the miracle can occur, there is a temporal limitation on when it occurred. From the Salvadoran Church guidelines: a “miracle performed after beatification is required for canonization.” Fr. Woestman confirms that the miracle must occur at some point in time after Romero was beatified. 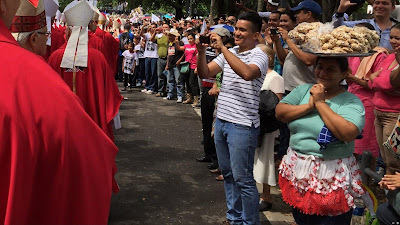 “The cure must be after the beatification; any time after the beatification, even immediately after.” Archbishop Romero was beatified on Saturday May 23, 2015, at approximately 10:26 A.M. San Salvador time. The miracle must occur sometime after that time. Finally, beyond the need for prayers for intercession in specific cases, the faithful could and should pray for the canonization of Archbishop Romero, generally. The supporters of the Servant of God Dorothy Day who pray for her beatification are exemplary in this regard, as are the Knights of Columbus who pray for the beatification of their founder Fr. McGivney. Both groups have organized structured and detailed programs to encourage constant prayer invoking their patrons. David Mueller, of the Dorothy Day Canonization Support Network, tells «Super Martyrio» that Dorothy Day’s supporters have organized 54 groups numbering over 2,000 members who pray for Day’s cause. Mueller met Day in the 1970s, and believes he too may have been the beneficiary of her intercession when he recovered from bile duct cancer in 2005. Day’s supporters have met and exceeded their goal of having at least 31 prayer groups so that if they each pray at least once a month on a different day of the month, there is literally a group praying for Day’s beatification every day of the year. Although it is too early in Day’s process to investigate miracles, her supporters are lining up many potential cases. “And if you believe in the power of prayer like we do, it is well worth it,” says Mueller. 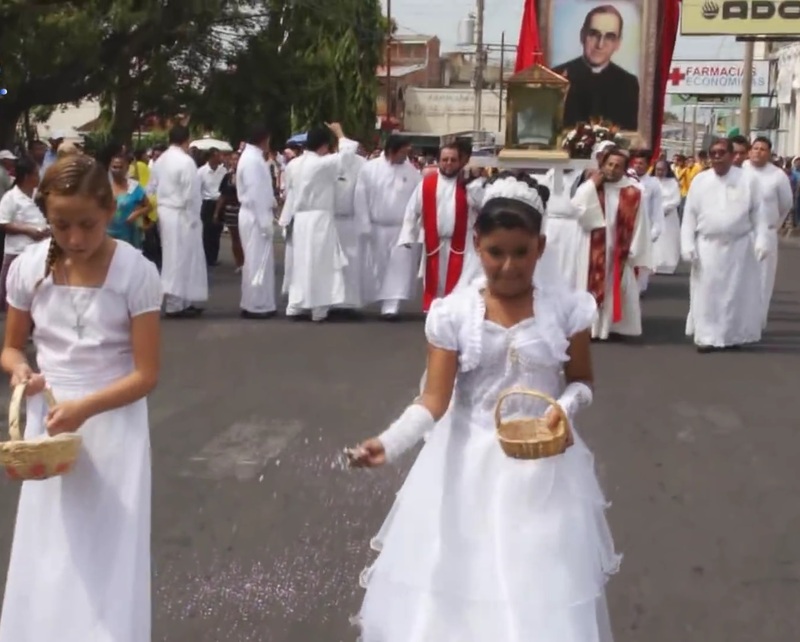 Niñas lanzan pétalos de flores en una procesión de las reliquias del Beato Oscar Romero en Zacatecoluca, El Salvador, el 18 de julio 2015. 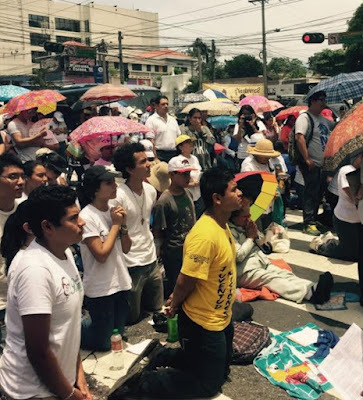 Tras la beatificación de Monseñor Óscar A. Romero en mayo, la Arquidiócesis de San Salvador promulgó directrices para el milagro que se requerirá para que el Beato Romero pueda avanzar hacia la santidad, la fase final del proceso de canonización. De acuerdo con el documento publicado por la Iglesia salvadoreña y un experto sobre la canonización consultado por «Súper Martyrio», para que el Beato Romero se convierta en “San Romero”, sus seguidores tendrán que demostrar la ocurrencia de un milagro a través de su intercesión, y comprobarlo por medio de un riguroso proceso médico de confirmación. «Súper Martyrio» entrevistó al P. William H. Woestman, omi, JCD, un abogado canónico y autor de un tomo prominente sobre la canonización de santos para que nos ayude a comprender lo que en cuanto a un milagro se requiere. El Padre Woestman editó Canonización: Teología, historia, Proceso, 2ª ed (Ottawa, Facultad de Derecho Canónico de Saint Paul University, 2014, 541 págs.). Actualmente se desempeña como Promotor de Justicia del Tribunal Metropolitano de la Arquidiócesis de Chicago, donde un milagro por otro candidato a la santidad de alto perfil está siendo estudiado. “Estamos en el proceso de investigación de un supuesto milagro por la intercesión del Beato John Henry Newman”, explica el P. Woestman. El Cardenal Newman fue beatificado por el Papa Benedicto XVI en 2010 y, al igual que Mons. Romero, está a un milagro de ser declarado santo. También platicamos con David Mueller, de la Red de Apoyo a la canonización de Dorothy Day, acerca de la oración para apoyar la causa de un santo. Revisando algunos conceptos básicos, el proceso de la santidad consiste en dos pistas, y cada cual tiene dos pasos dentro de su trayectoria. En primer lugar, una persona puede ser santificada ya porque: (A) ha llevado una vida santa (el “camino de los confesores”—tal como el cardenal Newman) o (B), ha muerto por la fe (el “camino de los mártires”—tal como Mons. Romero). En segundo lugar, y no obstante por cual camino vaya, el proceso consiste de dos etapas: (1) la beatificación (que tanto Newman como Romero han alcanzado) y (2) la canonización (que ninguno de los dos ha alcanzado todavía). Los confesores necesitan un milagro (y una declaración de “virtud heroica”) para ser beatificados y un segundo milagro para ser canonizados. Para los mártires, el martirio en sí es el milagro que cuenta para la beatificación, pero se requiere un segundo milagro para la canonización. Por ende, Mons. Romero, ya beatificado, necesita un milagro para la canonización. Los tipos de milagros que la Iglesia requiere para la canonización, de acuerdo con la orientación de la Iglesia Salvadoreña son “curaciones prodigiosas después de la invocación a un Siervo de Dios o a un Beato”. En consecuencia, el milagro requerido debe ser una curación médica que no tiene explicación según los procesos naturales: tal como, “la curación instantánea de una grave enfermedad, sin haber hecho uso de medicina alguna o de otras curas; la desaparición de una atrofia grave; o el hecho de que se cicatrice una herida instantáneamente”. (Como la orientación explica, “la naturaleza puede corregir la atrofia de un miembro o cicatrizar una herida, pero no lo hace nunca instantáneamente”). Para ilustrar, el milagro que llevó a la canonización de San Juan Pablo II fue el de una mujer que se curó de una aneurisma cerebral después que los médicos le habían dicho que sólo tenía un mes de vida. El fundador del Opus Dei San Josemaría Escrivá de Balaguer fue canonizado después de la cura de un paciente de radiodermitis crónica cancerosa, de esta enfermedad terminal. Santa Kateri Tekakwitha se convirtió en la primera santa “India” de Norte América en 2012 después de que un joven sobrevivió a una severa bacteria carnívora que los médicos habían perdido la esperanza de detener, declarando que el muchacho moriría. El Padre Woestman explica que no es necesario que el milagro se produzca dentro del territorio en que Romero es reconocido como Beato (a diferencia de la canonización, que corresponde a la Iglesia universal, la beatificación se limita a una zona geográfica determinada). Por lo tanto, la persona que reporta un milagro no tiene que ser de El Salvador. “Puede venir de cualquier persona, de cualquier parte del mundo”. De hecho, la persona que declara el milagro ni tiene que ser católica (por lo tanto, la frase en la introducción de la orientación de la Iglesia Salvadoreña que habla de “un milagro que, por intercesión del Beato Oscar Romero, Obispo y Mártir, haya obtenido un fiel cristiano” no debe tomarse como limitación). En el caso de que el milagro se produzca en una diócesis distinta de San Salvador, “el obispo de la diócesis en la que la cura tuvo lugar es competente para llevar a cabo la investigación”, explica el P. Woestman, señalando el milagro en el caso mencionado anteriormente del Beato Newman (la causa Newman es promovida por el Oratorio de Birmingham en Inglaterra, pero el milagro se está investigando en los EE.UU.). Aunque no hay ninguna limitación geográfica de donde puede ocurrir el milagro, sí existe una limitación temporal sobre cuando ocurrió. Dice la orientación de la Iglesia Salvadoreña: “Se requiere otro milagro realizado después de la Beatificación para obtener la Canonización”. El P. Woestman confirma que el milagro debe ocurrir en algún momento después de que Romero fuera beatificado. “La cura debe ser posterior a la beatificación; cualquier momento después de la beatificación, incluso inmediatamente después”, dice. Monseñor Romero fue beatificado el sábado 23 mayo, 2015, aproximadamente a las 10:26 AM Tiempo de San Salvador. El milagro debe ocurrir en algún momento después de esa hora. Aquellos que esperan obtener un milagro por la intercesión del Beato Romero deben orar a Oscar Romero utilizando la tarjeta de oración publicada por la iglesia de San Salvador (foto). También deben tomar medidas para garantizar que cualquier milagro obtenido a través de su oración sea trazable a Romero para que pueda ser utilizado para promover su canonización. “La intercesión debe ser principalmente a través del Beato Romero”, dice el P. Woestman. Teniendo en cuenta este requisito, sería razonable tomar medidas que no dejarán duda de que la intercesión vino “principalmente a través del Beato Romero”. Por ejemplo, si la familia y los amigos del enfermo oran sin cesar exclusivamente al Beato Romero, entonces será más adelante más fácil demostrar que la cura se obtuvo “principalmente a través del Beato Romero”, mientras que, si rezan al Beato Romero, pero también a San José y San Judas y San Antonio, entonces el tema puede complicarse, y sería más difícil demostrar que la curación se obtuvo “principalmente a través del Beato Romero”. Por último, más allá de la necesidad de oraciones por la intercesión en casos específicos, los fieles pueden y deben orar por la canonización de Monseñor Romero, generalmente. Los seguidores de la Sierva de Dios Dorothy Day que rezan por su beatificación son ejemplares en este sentido, como lo son los Caballeros de Colón que rezan por la beatificación de su fundador el P. McGivney. Ambos grupos han organizado programas estructurados y detallados para alentar constante oración invocando sus patronos. David Mueller, de la Red de Apoyo a la canonización de Dorothy Day, dice a «Súper Martyrio» que los devotos de Day han organizado 54 grupos que suman más de 2.000 miembros que oran por la causa de Day. Mueller conoció a Day en la década de 1970, y cree que también puede haber sido el beneficiario de su intercesión cuando se recuperó de un cáncer de las vías biliares en 2005. Los seguidores de Day han logrado—y superado—su meta de tener por lo menos 31 grupos de oración de manera que si cada uno reza al menos una vez al mes en un día diferente del mes, habrá literalmente un grupo orando por la beatificación Day todos los días del año. Aunque es demasiado pronto en el proceso de Day para investigar milagros, sus seguidores están preparando muchos casos prometedores. “Y si uno cree en el poder de la oración, como nosotros creemos, bien vale la pena”, dice Mueller. Ofrezco nuevamente el «Rosarium» publicado aquí para este propósito sagrado. Y en las palabras de la Iglesia Salvadoreña: “Pedimos al Señor que todo sea para su gloria y para el bien de todos los que lo aman”. Beato Óscar Romero, ¡ruega por nosotros! Ragazze gettando petali di fiori in una processione delle reliquie del Beato Oscar Romero in Zacatecoluca, El Salvador, il 18 luglio 2015. Dopo la beatificazione di monsignor Oscar A. Romero lo scorso maggio, l’Arcidiocesi di San Salvador ha promulgato linee guida per quanto riguarda il miracolo necessario per fare il Beato Romero avanzare verso la santità, la fase finale del processo di canonizzazione. Secondo il documento della Chiesa salvadoregna e un esperto dalla canonizzazione consultato da «Super Martyrio», per fare il Beato Romero diventare “San Romero,” i suoi sostenitori dovranno dimostrare la esistenza di un miracolo per sua intercessione, e dimostrarlo per un rigoroso processo di conferma medica. «Super Martyrio» ha intervistato p William H. Woestman, omi, JCD, un canonista e autore di un tomo sulla canonizzazione dei santi che ci aiutano a comprendere i requisiti per un miracolo. P. Woestman ha curato Canonizzazione: Teologia, Storia, Processo, 2a ed (Ottawa, Facoltà di Diritto Canonico, Saint Paul University, 2014, 541 pagg.). Attualmente è Promotore di Giustizia per il Tribunale Metropolitano dell’arcidiocesi di Chicago, dove un miracolo da un altro candidato alla santità di alto profilo è in fase di studio. “Siamo nel processo di indagare su un presunto miracolo per intercessione del Beato John Henry Newman”, spiega P. Woestman. Il cardinale Newman è stato beatificato da Papa Benedetto nel 2010 e, come Mons. Romero, è uno miracolo lontano da essere dichiarato santo. Abbiamo anche parlato di David Mueller, della Dorothy Day Canonizzazione Support Network, della preghiera per sostenere la causa di un santo. Rivedendo le basi, il processo di santità consiste di due tracce, ognuna delle quali ha due passi di sua traiettoria. In primo luogo, una persona viene santificata perché: (A) che hanno condotto una vita santa (la “via dei confessori”—come il Cardinale Newman) o (B) sono stati uccisi per la fede (la “via dei martiri”—come Mons. Romero). Secondo e indipendentemente da quale è il percorso, il processo consiste di due fasi: (1) la beatificazione (che sia Newman come Romero hanno raggiunto) e (2) la canonizzazione (che nessuno ha ancora raggiunto). I confessori hanno bisogno di un miracolo (e una dichiarazione di “virtù eroiche”) per essere beatificati e un secondo miracolo per essere canonizzati. Per martiri, il martirio è di per sé il miracolo che conta verso la beatificazione, ma è necessario un secondo miracolo per la canonizzazione. Così, Mons. Romero, che è stato beatificato, ha ora bisogno di un miracolo per essere canonizzato. I tipi di miracoli che la Chiesa richiede per la canonizzazione, secondo le linee guida della Chiesa Salvadoregna sono “guarigioni miracolose, dopo l’invocazione di un Servo di Dio o di un beato”. Quindi, il miracolo richiesto richiede una guarigione medica che non può essere spiegata con processi naturali: come “la guarigione istantanea di una grave malattia, senza aver usato farmaci o altre cure; la scomparsa di una grave atrofia; o che una ferita si guarisce istantaneamente”. (Le linee guida spiegano, “la natura può correggere l’atrofia di un arto o di guarire una ferita, ma non lo fa subito”.) Per illustrare, il miracolo che ha portato alla canonizzazione di San Giovanni Paolo II ha coinvolto una donna che è stata guarita da un aneurisma cerebrale dopo che i medici le avevano detto che lei aveva solo un mese da vivere. Il fondatore dell’Opus Dei San Josemaría Escrivá è stato canonizzato in seguito alla guarigione di un malato di radiodermite cancerosa cronica di questa malattia terminale. Santa Kateri Tekakwitha è diventato la prima santa nativo americano nel 2012 dopo che un giovane ragazzo sopravvissuto ad un grave batterio carnivoro che i medici avevano rinunciato speranza, e avevano dichiarato che sarebbe morto. P. Woestman spiega che il miracolo non deve verificarsi sul territorio provinciale entro il quale Romero è riconosciuto come “Beato” (a differenza della canonizzazione che riguarda la Chiesa universale, la beatificazione è limitata ad una determinata zona geografica). Pertanto, la persona che segnala un miracolo non deve essere da El Salvador: “Può essere da chiunque, in qualsiasi parte del mondo” disse P. Woestman. Infatti, la persona che afferma un miracolo non ha bisogno di essere cattolico (quindi, la frase nell’introduzione al orientamento della Chiesa salvadoregna che parla di “un miracolo ottenuto da un fedele cristiano attraverso l’intercessione del Beato Oscar Romero” non deve essere presa come una limitazione). Nel caso in cui il miracolo si verifica in una diocesi diversa da San Salvador, “il vescovo della diocesi in cui la cura ha avuto luogo è competente a svolgere l’indagine,” spiega p Woestman, indicando il miracolo nel caso Newman (la causa del Beato Newman è promosso dal Birmingham Oratory in Inghilterra, ma il miracolo è indagato negli Stati Uniti). Anche se non vi è alcuna limitazione geografica per il miracolo, c’è una limitazione nel tempo quando si è verificato. Dalle linee guida della Chiesa salvadoregna: “per la canonizzazione è necessario avere un miracolo dopo la beatificazione”. P. Woestman conferma che il miracolo deve avvenire dopo Romero è stato beatificato. “La cura deve essere dopo la beatificazione; in qualsiasi momento dopo la beatificazione, anche subito dopo”. Mons. Romero è stato beatificato il Sabato 23 Maggio 2015, a circa 10:26 Tempo San Salvador. Il miracolo deve avvenire qualche tempo dopo quel momento. 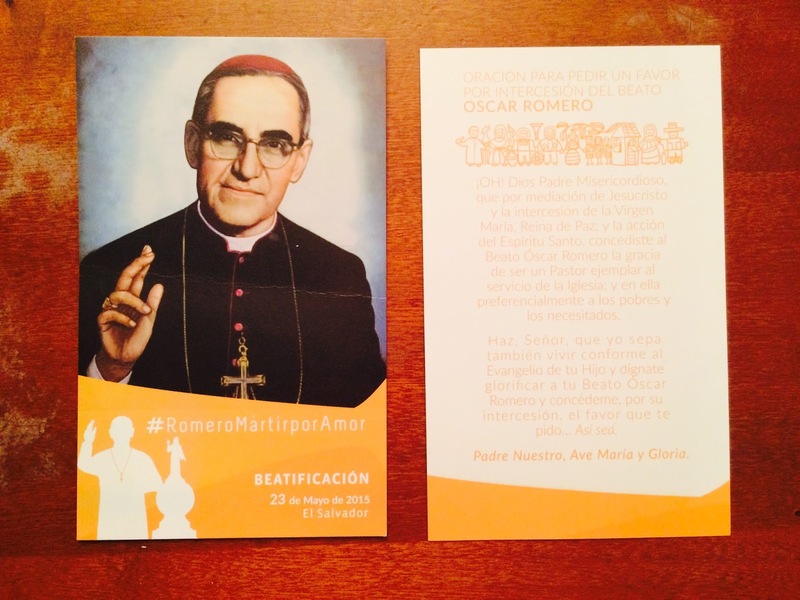 Coloro che sperano di ottenere un miracolo per l’intercessione del Beato Romero dovrebbero pregare Oscar Romero utilizzando la scheda di preghiera pubblicato dalla chiesa di San Salvador (foto). Essi dovrebbero anche adottare misure per garantire che ogni miracolo ottenuto per la loro preghiera è riconducibile a Romero in modo che possa essere utilizzato per promuovere la sua canonizzazione. “L’intercessione deve essere principalmente attraverso il Beato Romero” dice p Woestman. Dato questo requisito, sarebbe ragionevole prendere misure che no lasceranno dubbio che l’intercessione è venuto “principalmente attraverso il Beato Romero”. Ad esempio, se la famiglia e gli amici pregano senza sosta al beato Romero esclusivamente, in seguito sarà più facile dimostrare che una cura è stata ottenuta “principalmente attraverso il Beato Romero”, mentre, se pregano al beato Romero, ma anche a San Giuseppe e S. Giuda e S. Antonio, il problema può essere offuscato, e sarebbe più difficile dimostrare che una successiva guarigione è stata ottenuta “principalmente attraverso il Beato Romero”. Infine, al di là della necessità di pregare per l’intercessione in casi specifici, i fedeli possono e dovrebbero pregare per la canonizzazione di Mons. Romero, in generale. I sostenitori della Serva di Dio Dorothy Day che pregano per la sua beatificazione sono esemplari in questo senso, come lo sono i Cavalieri di Colombo che pregano per la beatificazione del loro fondatore il p. McGivney. Entrambi i gruppi hanno organizzato programmi strutturati e dettagliati per favorire la continua preghiera invocando i loro patroni. David Mueller, della Dorothy Day Canonizzazione Support Network, dice «Super Martyrio» che i sostenitori di Dorothy Day hanno organizzato 54 gruppi che se ne contano più di 2.000 membri pregando per la causa di Day. Mueller ha incontrato Day nel 1970, e crede anche essere stato un beneficiario della sua intercessione, quando ha recuperato da cancro del dotto biliare nel 2005. I sostenitori di Day hanno incontrato e ha superato il loro obiettivo di avere almeno 31 gruppi di preghiera in modo che se ogni pregano almeno una volta al mese, in diversi giorni del mese, c’è letteralmente un gruppo pregando per la beatificazione di Day tutti i giorni dell’anno. Anche se è troppo presto nel corso di Day per indagare miracoli, i suoi sostenitori hanno in fila molti casi potenziali. “E se si crede nel potere della preghiera come facciamo noi, ne vale la pena”, dice Mueller. Offro di nuovo il «Rosarium» pubblicato qui per questo scopo sacro. E nelle parole della Chiesa salvadoregna: “Chiediamo al Signore che tutti sia per la Sua gloria e per il bene di coloro che Lo amano”. Beato Oscar Romero, prega per noi! This was originally published in FirstThings.com on July 8, 2015. 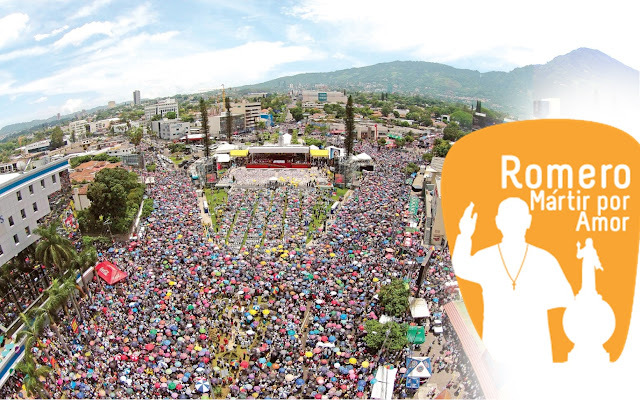 Salvadoran Archbishop Oscar Romero, who was assassinated by a right-wing sniper while celebrating Mass in 1980, was raised to the altars in a magnificent beatification ceremony in San Salvador this May. Romero’s beatification was full of notes of reconciliation, which seemed to mark the official end of the mourning for the Salvadoran civil war, officially unleashed by his assassination. 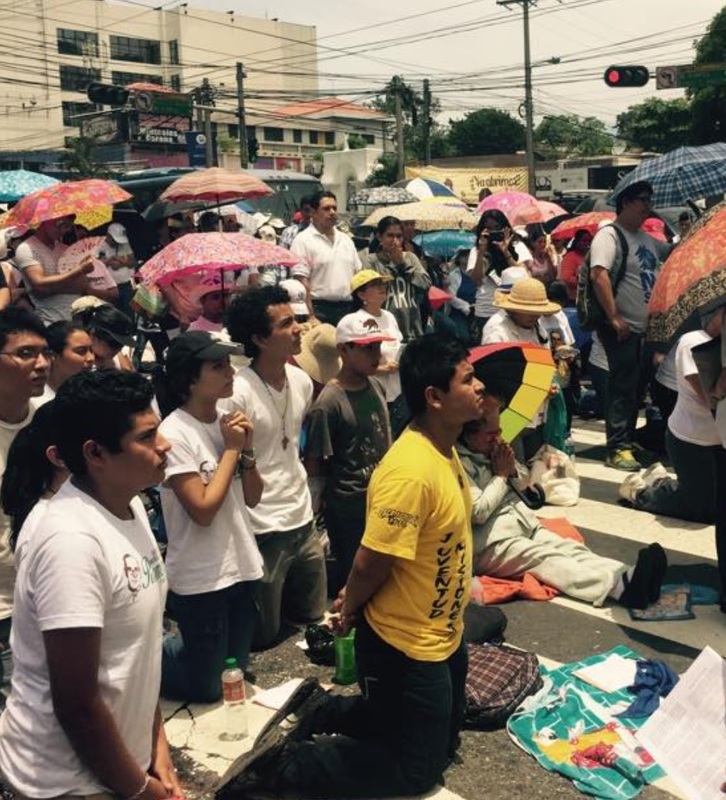 The words of Psalm 125, intoned by the choir, seemed to sum up the day: “They that sow in tears shall reap rejoicing.” Half a million gathered around a temporary altar upholstered in martyr’s red and topped in Vatican yellow and white, on an iconic San Salvador plaza named after the World’s Savior (“El Salvador del Mundo,” the country’s namesake patron saint). Five Latin American presidents were in attendance, and both the Pope and the President of the United States issued statements for the occasion. Nearly 1,300 priests concelebrated; the opening procession took half an hour to complete. The temporary altar was backed by an imposing volcano, and topped by an unexpected solar halo which appeared soon after Romero’s beatification was proclaimed. When Cardinal Angelo Amato, prefect of the Congregation for the Causes of Saints and the Vatican official in charge of the ceremony, entered the square, he was smiling and waving, apparently partaking of the rapturous mood. The joyous tone of the 125-piece, four-part choir was reminiscent of an American Gospel group, and an unknowing observer could be forgiven for not realizing this was the beatification of a man who had been killed a mere thirty-five years before amidst widespread massacres and a fratricidal civil war. Everything about the scene stood in stark contrast to the dread of those years. Whereas Romero had previously been a divisive figure, he was now universally embraced. The sister and the son of the man accused of having ordered his murder had VIP seats to the ceremony. Where he had been rejected by his fellow Salvadoran bishops, the approximately one hundred bishops at the beatification all wore chasubles bearing Romero’s episcopal shield, and Cardinal Amato wore a miter emblazoned with Romero’s episcopal motto: “Sentir con la Iglesia” (“To Think and Feel With the Church”). Street vendor watches the bishops’ procession. “Following the event, watching the course of the Eucharistic celebration,” said Luis Badilla, a Rome-based church-watcher, “I got the strong sense that Romero would be very happy. It seemed to me to be a very meek, very humble ceremony. It was splendid. Nothing was missing and nothing abounded. It was a ceremony about dignity in poverty, just like Romero.” Attendance was at least equal to, and likely exceeded, that of the beatifications of Padre Pio, Mother Teresa and St. Josemaría Escrivá, yet everything went off without a hitch. Read the rest of this story at FirstThings.com. Faithful kneel on the pavement during Communion. Esto fue publicado originalmente en FirstThings.com el 8 de julio de 2015. El arzobispo salvadoreño Óscar Romero, asesinado por un francotirador de ultraderecha celebrando misa en 1980, fue elevado a los altares en una magnífica ceremonia de beatificación en San Salvador este mes de mayo. La beatificación de Romero estuvo llena de notas de reconciliación, que parecían marcar el final oficial del luto por la guerra civil salvadoreña, oficialmente desatada por su asesinato. Las palabras del Salmo 125, entonado por el coro, parecía resumir el día: “Los que sembraban con lágrimas cosechan entre cantares”. Medio millón de personas se reunieron alrededor de un altar temporal tapizado en rojo martirial y coronado en los colores Vaticanos de amarillo y blanco, en una emblemática plaza de San Salvador llamada Salvador del Mundo por el homónimo patrón del país. Cinco presidentes latinoamericanos estuvieron presentes, y tanto el Papa como el Presidente de los Estados Unidos emitieron declaraciones para la ocasión. Casi 1.300 sacerdotes concelebraron; la procesión de entrada se tardó media hora en completar. El templete estuvo respaldado por un volcán imponente, y sobrevisto de un halo solar inesperado que apareció poco después que fue proclamada la beatificación de Romero. Cuando el cardenal Angelo Amato, prefecto de la Congregación para las Causas de los Santos—el funcionario Vaticano a cargo de la ceremonia—entró en la plaza, estaba sonriendo y saludando, al parecer incorporándose al espíritu entusiasta del evento. El tono alegre del coro de 125 miembros en cuatro voces hacía pensar en un grupo evangélico norteamericano, y un observador desinformado podría ser perdonado por no darse cuenta que se trataba de la beatificación de un hombre que había sido asesinado apenas treinta y cinco años antes en medio de masacres generalizadas y una fratricida guerra civil. Todo sobre la escena estaba en marcado contraste con el pavor de aquellos años. Mientras que Romero había sido anteriormente una figura divisiva, ahora era universalmente acogido. La hermana y el hijo del hombre acusado de haber ordenado su asesinato tenían asientos VIP en la ceremonia. Si bien Romero había sido rechazado por sus compañeros obispos salvadoreños, los aproximadamente cien obispos en la beatificación vestían casullas luciendo su escudo episcopal, y el Cardenal Amato llevaba una mitra blasonada con el lema episcopal de Romero: “Sentir con la Iglesia”. Vendedora ve la procesión de los obispos. “Siguiendo el evento, viendo el transcurso de la celebración eucarística”, dijo Luis Badilla, un observador de la iglesia con sede en Roma, “tengo la fuerte sensación de que Romero estaría muy feliz. Me ha parecido una ceremonia muy mansa, muy humilde, bellísima. No ha faltado nada y nada ha sobrado. Ha sido una ceremonia desde la pobreza en dignidad, al igual que Romero”. La asistencia fue al menos igual a, y probablemente ha superado, la de las beatificaciones del Padre Pío, de la Madre Teresa y de San Josemaría Escrivá, pero todo ha corrido sin ningún contratiempo. Lea el resto de esta nota (en inglés) en FirstThings.com. Fieles se arrodillan en el pavimento durante la Comunión.